Sheila died on 26 January 1965 in Palmerston North at age 85. [S542] Index - New Zealand BDMs online, at http://www.bdmhistoricalrecords.dia.govt.nz/, Birth Reg. No. 1880/12603. [S443] CD - NZ Marriages, CD - NZ Marriages 1836-1956 V2, NZ Registrar General's Folio 3165. [S542] Index - New Zealand BDMs online, at http://www.bdmhistoricalrecords.dia.govt.nz/, Marriage Reg. No. 1903/3846. [S542] Index - New Zealand BDMs online, at http://www.bdmhistoricalrecords.dia.govt.nz/, Death Reg. No. 1938/25098, aged 62. [S542] Index - New Zealand BDMs online, at http://www.bdmhistoricalrecords.dia.govt.nz/, Birth Reg. No. 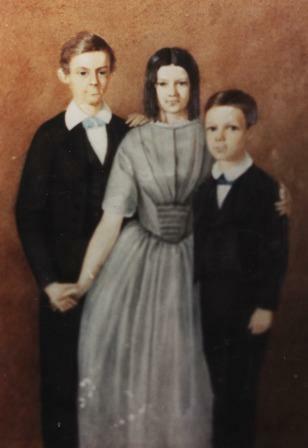 1863/3078. [S542] Index - New Zealand BDMs online, at http://www.bdmhistoricalrecords.dia.govt.nz/, Birth Reg. No. 1866/4450. [S443] CD - NZ Marriages, CD - NZ Marriages 1836-1956 V2, NZ Registrar General's Folio 3725. [S542] Index - New Zealand BDMs online, at http://www.bdmhistoricalrecords.dia.govt.nz/, Marriage Reg. No. 1895/2219. [S924] BDM Registrar of New Zealand, marriage record, Reg. No. 1916/10971. [S542] Index - New Zealand BDMs online, at http://www.bdmhistoricalrecords.dia.govt.nz/, Death Reg. No. 1913/5834, aged 43. [S443] CD - NZ Marriages, CD - NZ Marriages 1836-1956 V2, NZ Registrar General's Folio 2199. [S542] Index - New Zealand BDMs online, at http://www.bdmhistoricalrecords.dia.govt.nz/, Death Reg. No. 1933/7027, aged 66. The following autobigraphical details are sourced from the NZ Dictionary of Biographies, and although interesting, are full of errors (which they refuse to correct). Especially glaring is the reference to Alexander Macdonald moving to missionary work at Ruapuke, which is total garbage - there seem to be a confusion with Johann Wohlers, whose descendents married Macdonalds. However, the entry is reproduced here as it does provide a good overview of his life. "Tom took great pride in his Scottish descent: one of his great-grandfathers, Alexander Macdonald, had sailed from Wester Ross, Scotland, to Samoa as a missionary in the 1830s, and thence to Ruapuke Island in Foveaux Strait. Another great-grandfather, Thomas Spencer Forsaith, was elected to New Zealand’s first parliament in 1854, and was a member of its shortest ministry. 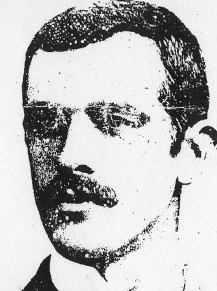 After matriculating from Southland Boys’ High School, Tom Macdonald joined the Union Steam Ship Company of New Zealand, serving as purser on a number of the company’s ships. In 1918 he volunteered for military service and went to the Middle East with the final draft of the New Zealand Expeditionary Force. On his return from the war he worked as a teamster and shepherd, then in 1923 acquired his own farm at Rankleburn, near Tapanui. He was married in Tapanui on 7 April 1926 to Elsie Ann Stuart, a fellow Southlander. A keen rugby player, he represented West Otago in 1925. He also belonged to the local Masonic lodge, becoming its worshipful master in 1931. In 1937 Macdonald sold his farm and moved to Gore. At the general election in 1938 he stood for Parliament as the New Zealand National Party candidate in the Mataura electorate, winning comfortably against the long-serving independent MP and former mayor of Gore, Davy McDougall. Macdonald’s move showed considerable self-confidence, for the first Labour government (which McDougall supported) was still riding high. Enlisting again as a private in 1940, Macdonald would have the rare distinction among MPs of serving in the Middle East in both the First and Second NZEF. During his second stint of active service he rose to the rank of captain before being invalided home in 1943 because of persistent illness. Later that year he was re-elected unopposed in the Mataura electorate. In 1946, when the electorate disappeared, he succeeded the former leader of the National Party, Adam Hamilton, in the neighbouring electorate of Wallace. Three years later he was appointed to Sidney Holland’s cabinet as minister of defence, a portfolio he held until his retirement from politics in 1957. Late in 1954 he acquired the additional portfolios of external affairs and island territories. Macdonald was thus responsible for the conduct of New Zealand’s defence and foreign policy during an important transition in the country’s international relations. In 1954, on becoming a member of the South East Asia Collective Defence Treaty, New Zealand transferred its defence commitment from the Middle East. The following year it established its first diplomatic post in South East Asia, and in 1956, in a new peacetime initiative, stationed armed forces abroad with the Commonwealth Far East Strategic Reserve in Malaya. As the spokesperson for the armed forces in cabinet, Macdonald had to contend with considerable indifference and even outright antagonism on the part of the prime minister, who as minister of finance was consistently reluctant to contemplate any increase in military commitments or expenditure. By contrast, Macdonald was highly regarded by his officials, whose only reservation was that he was too modest and insufficiently assertive: he simply ‘does not realize that he is quite as good as he is’, wrote the secretary for external affairs, Alister McIntosh. In 1957 McIntosh recorded that Holland had ‘worked up the most intense obsession against Tom Macdonald, whom he accuses of having kept the defence proposals from him for months with the intention of presenting him with a cut and dried plan’. It seems likely that frustration with Holland’s obstructionism over defence commitments and expenditure was the dominant motive in Macdonald’s decision to retire from politics before the 1957 elections. Macdonald’s relations with Holland’s successor, Keith Holyoake, were also cool. He was seen as an obvious choice to fill the vacant high commissionership in London when National was returned to power in 1960, but he was not, apparently, Holyoake’s first preference, and his appointment was not made for some months. 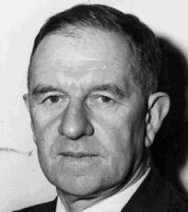 Although his original term, beginning in 1961, was extended until 1968, Macdonald was particularly aggrieved that he was not authorised to take leave in New Zealand during the whole of that period. His appointment coincided with mounting concern in New Zealand at the prospect that Britain might join the European Economic Community (EEC) and that unrestricted access of New Zealand’s agricultural exports to the United Kingdom would be put at risk. Whereas his predecessors had been able to delegate most of their substantive work to their staff, Macdonald had to lead from the front in seeking to persuade the British government and public that if Britain were to join the EEC, special measures would be needed to allow the continued entry of New Zealand’s agricultural products, especially butter, cheese and lamb, for which Britain had been the traditional market. He was notably successful in establishing first-name contacts with people who mattered both in politics and business, and his devotion to Freemasonry undoubtedly opened doors in the City of London. During his high commissionership, Macdonald was appointed concurrently as New Zealand’s first ambassador to the EEC in 1961, and its first ambassador to Ireland in 1966. Although Britain did not in fact join the Community until after his retirement, maintenance of New Zealand’s place in the British market remained his principal concern during his seven years in what was then regarded as New Zealand’s most important diplomatic post. In 1963 he was knighted (KCMG). During his time in Britain he often stayed with his cousins in Wester Ross and in 1963 he was named Scotsman of the Year. 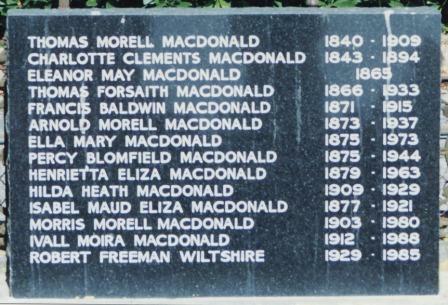 After returning to New Zealand, the Macdonalds lived in Waikanae. In his retirement Tom was able to pursue his interest in tramping, photography and gardening. He also enjoyed and had a talent for composing light verse. He attended school in 1905 at Invercargill, Southland. ‘Successful candidates: biographical sketches’. Otago Daily Times. 17 Oct. 1938: 16; and Templeton, I. ‘Peerage would honour this fine diplomat’. Auckland Star. 26 Feb. 1968. This explains in part the many errors (especially in the details taken from The Times obituary, which are largely rubbish). [S542] Index - New Zealand BDMs online, at http://www.bdmhistoricalrecords.dia.govt.nz/, Birth Reg. No. 1899/3782, and Death Reg. No. 1980/33796 gives this birthdate. [S597] Auckland War Memorial Museum Cenotaph database, at http://www.aucklandmuseum.com/war-memorial/online-cenotaph, NZEF Nominal Roll Vol IV, Roll 91, p8. [S443] CD - NZ Marriages, CD - NZ Marriages 1836-1956 V2, NZ Registrar General's Folio 2757. [S542] Index - New Zealand BDMs online, at http://www.bdmhistoricalrecords.dia.govt.nz/, Marriage Reg. No. 1926/2273. [S863] Newspaper - New Zealand Herald, Deaths. [S542] Index - New Zealand BDMs online, at http://www.bdmhistoricalrecords.dia.govt.nz/, Death Reg. No. 1975/47786. [S909] Newspaper - Wellington Evening Post, issue of 12 Apr 1980, news item. [S6] Newspaper - Times of London, issue of 18 Apr 1980, issue 60604, p19, col G; Obituaries. Note that the origin of the detail in this obituary is unknown (the columnist was 'B'), but much of the content is pure fabrication - unfortunately detail has been copied and used in other biographies. [S542] Index - New Zealand BDMs online, at http://www.bdmhistoricalrecords.dia.govt.nz/, Death Reg. No. 1980/33796. [S570] Wellington City Cemeteries database, at https://wellington.govt.nz/services/community-and-culture/…, Karori crematorium, record 47788. One of his early legal actions was to perform the eviction of a well-known local identity, the so-called 'Black Doctor', who was squatting on land owned by Mr J. Thompson, on the corner of Dee and Leet Streets. However, this resulted in the receipt of a letter reading "If you so pretend to my property and as I heard you were going to eject me, then I will kill you, so help me God. I warn you for your life. - Antonio Williams, nowne az de Blaque Doctor" which bore the symbol of a small dagger with the letters A nd M on the handle. The Black Doctor was neither black, nor a doctor, but was possibly of Spanish or Nth American ancestry and may have arrived in Invercargill via an American whaler. His voluminous robes were described as being of a 'Spanish grandee' and he was fond of airing a Johnsonian English vocabulary. His knowledge of herbs and herbal remedies contributed to the 'doctor' of his title. His 'rooms' were more like a wigwam of branches propped against a tree bough, rather than a house. 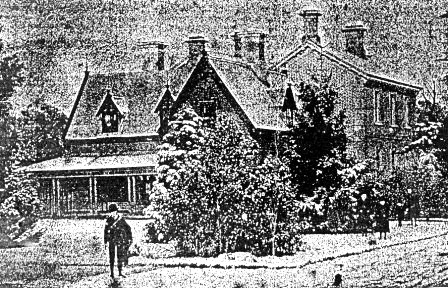 Despite the threatening letter, he moved further up Dee St and continued his unique lifestyle until his death in May 1872 at Invercargill Hospital. 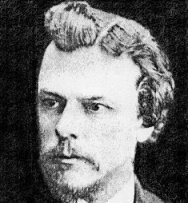 He was a member of the Southland Provincial Council for Invercargill (1864-66) and for Campbelltown (1869-70) and was solicitor to the Council until its abolition, when he was appointed Crown Solicitor for the Southland District. He was chairman of the Southland Education Board for 11 years, of the 'Southland Times' to 1896 and was also a member of the Presbyterian Synod. [S922] BDM Registrar of New Zealand, birth record, Reg. No. 1877/14047; this states his birth-place as the 'Navigator Islands', which was their previous name. [S703] Newspaper - Southland Times, Issue of Mar 1962. [S703] Newspaper - Southland Times, Issues of Mar 1962 & 29 Jul 1981. [S586] Invercargill City Cemetery database, at http://www.icc.govt.nz/ServicesA-Z/Cemeteries/…, email discussions with the Cemetery in Apr 2017. [S542] Index - New Zealand BDMs online, at http://www.bdmhistoricalrecords.dia.govt.nz/, Death Reg. No. 1894/6630. [S396] Ryerson Index to Australian Newspaper Death and Obituary Notices, at http://www.rootsweb.com/~nswsdps/dpsindex.htm, Sydney Morning Herald of 14 Dec 1894. [S443] CD - NZ Marriages, CD - NZ Marriages 1836-1956 V2, NZ Registrar General's Folio 1398. [S542] Index - New Zealand BDMs online, at http://www.bdmhistoricalrecords.dia.govt.nz/, Marriage Reg. No. 1906/2715. [S542] Index - New Zealand BDMs online, at http://www.bdmhistoricalrecords.dia.govt.nz/, Death Reg. No. 1909/2224, aged 68. [S136] Cemetery Marker - Thomas Morell Macdonald / Charlotte Clements Forsaith and 12 family members, Invercargill Eastern cemetery, NZ, Block 9, plot 23. [S542] Index - New Zealand BDMs online, at http://www.bdmhistoricalrecords.dia.govt.nz/, Death Reg. No. 2012/10615 gives this birthdate. [S542] Index - New Zealand BDMs online, at http://www.bdmhistoricalrecords.dia.govt.nz/, Death Reg. No. 2012/10615. [S1131] MemoryTree NZ, at http://www.amemorytree.co.nz/index.php, aged 80, VJ Williams Funeral Directors. He was supposedly named Rex (as he was always known) due to his birthdate matching the Coronation. He worked at Tekapo 1946-52 in a Civil Engineering (materials) capacity, and later in Fiji (1956) on the rebuilding of Nadi Airport. 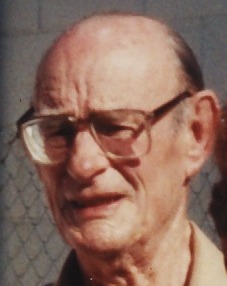 Walter died on 2 June 1998 in Akaroa, Canterbury, at age 86. [S542] Index - New Zealand BDMs online, at http://www.bdmhistoricalrecords.dia.govt.nz/, Birth Reg. No. 1911/25002. [S599] Interview - A M Ferguson, From conversations with him in late 1994). [S443] CD - NZ Marriages, CD - NZ Marriages 1836-1956 V2, NZ Registrar General's Folio 9945. [S612] GRO Scotland, birth/bapt record, Parish of Tobermory, Statutory Births, GRO 549/00 0002, recorded as illegitimate with no father registered. [S612] GRO Scotland, birth/bapt record, District of Anderston, Statutory Births, GRO 644/11 1205. [S918] GRO Scotland, death record, District of Johnstone, Statutory Deaths, GRO 644/00 0195, aged 59, as MACINNES, mother's maiden name GROUT. As an ice hockey player, he was goalie for the University of Michigan team, helping them to a third-place finish at the 1950 NCAA championship, and he also played for farm teams of the Boston Bruins and the Detroit Red Wings. He was later director of the Ann Arbor Amateur Hockey League until he left to become head coach at Michigan Technological University. [S829] Wikipedia, at http://www.wikipedia.org/, accessed 2018-04-02.